Having apparently decided that Warhammer: End Times—Vermintide was not a sufficiently lengthy title on its own, Fatshark has announced that the game's first paid DLC will be a new map entitled Schluesselschloss. (Gesundheit.) Another piece of free DLC is in the works as well, in the form of a new game mode called Last Stand. Last Stand, in which players square off against endless hordes of Skaven, will include a single level set within Ubersreik, the overrun town at the center of Vermindtide. 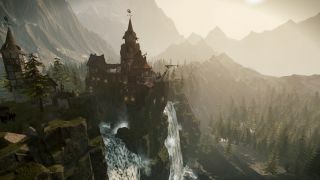 Schluesselschloss will enable players to take the fight beyond its walls and into the surrounding Grey Mountains—and because Fatshark doesn't want to “split up the community,” players who don't own the new map will still be able to join and play with someone who does. That's a nice touch. The obvious downside to all of this is that Schluesselschloss is an absolutely awful name, and so Fatshark is holding a little contest. Pop over to vermintide.com/namenick and give them a suggestion for a smooth-sounding nickname; the 100 best ideas will get the Schluesselschloss DLC for free. One point that isn't entirely clear is whether non-owners of Schluesselschloss will be able to move into the locations included with the DLC, or if the cross-compatibility is restricted to the single level that's included with the new game mode. I've emailed Fatshark, and I'll let you know what they have to say about it. Warhammer: End Times—Vermintide—Schluesselschloss, and the new Last Stand game mode, are set to come out at the end of February. Schluesselschloss, by the way, means “key lock” in German. I have no idea how that relates to killing Skaven. Update: Fatshark has confirmed that non-Schluesselschloss owners will be able to play on the Schluesselschloss map as long as they connect to someone who owns it. "Since we don’t want to split up the community, players will be able to play the map if they join someone who owns it. So, if your friend has bought the DLC, he can host the game and invite you to join it, even if you haven't actually purchased the DLC," a rep explained. "However, you won't be able to play the map on your own or host it unless you've bought the DLC."